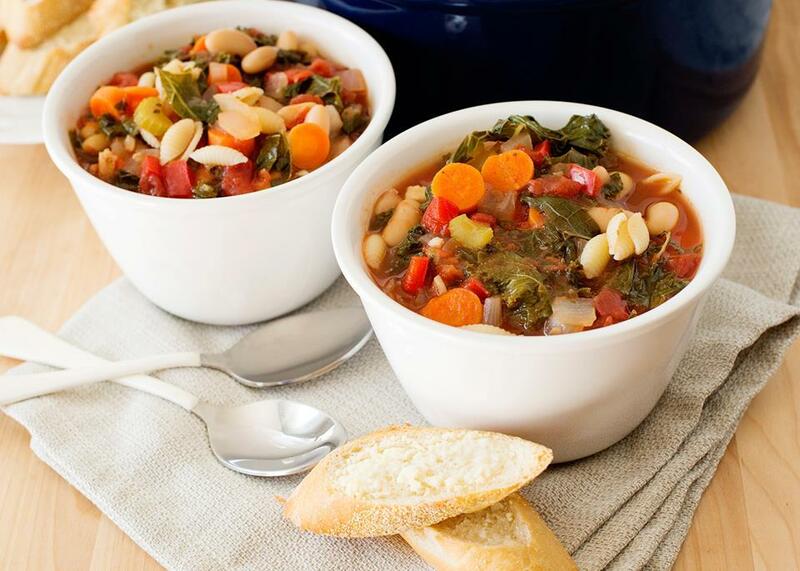 This hearty vegetarian soup is one of my absolute favorites. It is warm, soothing and is on the table in 30 minutes. Melt butter in large Dutch oven over medium heat. Add onions, carrots, celery and peppers to pot. Cook until soft, about 10 minutes. Add garlic, basil, salt and pepper. Cook for one minute. Add beans, tomatoes and broth. Simmer for 15 minutes. Add kale and cook until wilted. Add cooked pasta to bowl. Ladle soup over. Slice bread. Spread with butter and sprinkle with Parmesan. Toast in 400°F oven until toasted and golden brown. Serve alongside soup.